This one falls into the category of totally horrible movies that entertain you with how bad they are. I did not sit in the theater grumbling about how bad this movie was because I was too busy laughing at the unintentionally funny parts of it. As a film, this thing is B…A..Double D… BADD. An Treasury Agent teams up with a weatherman to try to stop a theft of $600 million dollars of old bills scheduled to be shredded. Oh, and the theft was planned to take place during a hurricane. Maggie Grace, Shannon from LOST and probably more well known as Liam Neeson’s oft kidnapped daughter from the Taken franchise, stars as the Treasury Agent Casey. Grace is passable in the role though she seemed to be able to do way more than one would expect a Treasury Agent to be able to do. She is, at least, a presence on the screen and is enjoyable to watch. Toby Kebbell, however, as Will was saddled with having to perform a… I’m going to guess… Southern accent throughout the entire film that was much more distracting than anything else happening. When he first started talking, I had to stifle a laugh. I would not stifle many more as the film progressed. Everything in here so so ridiculous. The stunts, the physics, the dialogue…. just terrible. The film started off in a flashback of young Will and his obnoxious brother Breeze out with their father as a hurricane approached. They were desperately trying to get away, but their truck winds up off road and the boys have to take shelter in an empty house in the middle of nowhere. As father started outside to try and get the truck freed, you knew what was going to happen. The storm started bringing the house down and the father got crushed by a rolling water tower in a moment that should not have been as hilarious as it looked. It reminded me again of LOST how so many people wound up getting killed by being hit by a bus. Move to the future, the brothers are estranged for, you know, reasons, but Will is still trying to help his brother as another massive hurricane is forming and only Will can correctly identify it because of his sense. But Breeze is a hard drinking loser who sits around his house in his underwear. Any guesses if Breeze will find redemption in the third act? When Casey and Will meet up and help each other out, since Will has a storm chasing vehicle he called the Dominator that can brave the storm. The pair of them go about keeping the bad guys at bay for much of the film. One of the funniest and cringe-worthiest moments came when Will grabbed a bunch of hubcaps and started hurling them Captain America-like into the wind of the hurricane and one of them wound up buried into one of the villain’s chests. Of course, Casey and Will were not always on the same page, despite them asking each other constantly, like Aladdin to Jasmine, “Do you trust me?” Casey suggested, despite Will’s strong objections, that they make the Dominator into a car bomb, much like Timothy McVeigh. We even go as far as seeing them grabbing bags of fertilizer. Thing is, I did not see them actually pull it off. Maybe I was dozing at the time…or perhaps it was a restroom break. Either way, it felt like it was dropped. 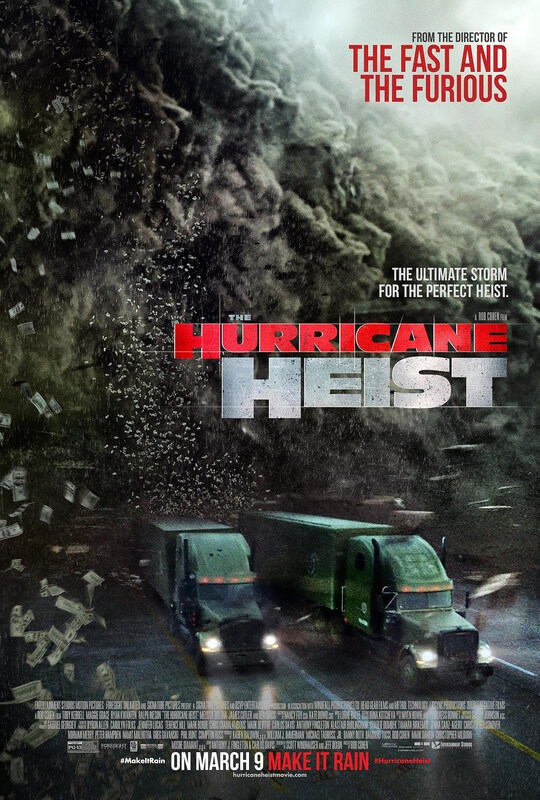 Then, the final semi truck chase scene with a barrelling hurricane behind them is as stupid as you can imagine. It felt like a Fast and the Furious movie with less sense or realism. The film was really bad and there was little redeeming quality to it. My mind immediately went to how great this film would be if it were being riffed by RiffTrax or covered by Mystery Science Theater 3000. That is this film’s future.